Reduction of aeroallergens at 24, 48 and 72 hours using the AO3000 Xtreme. Reduction of VOCs in one hour using the AO3000Xtreme. 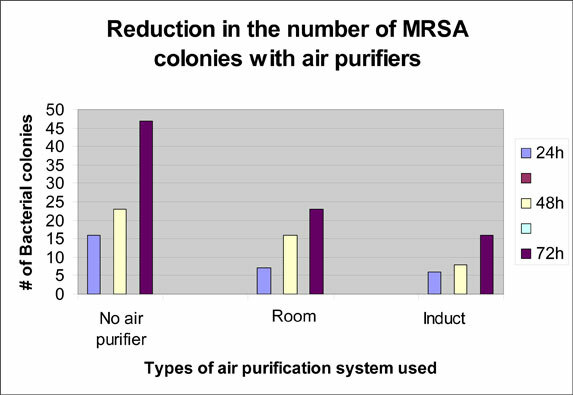 Reduction of MRSA on surfaces at 24, 48 and 72 hours using the AO Room air purifier and Induct 9. 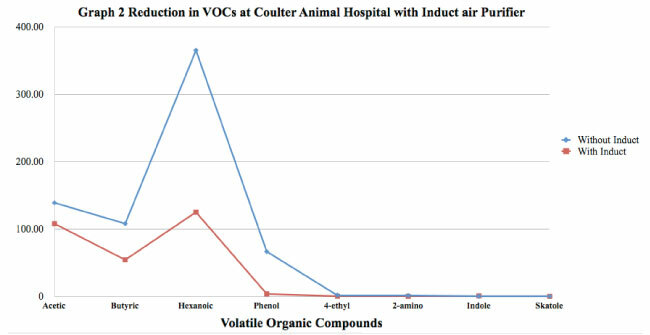 Reduction of VOCs in animal clinic while using the nano Induct 9. Reduction of mold in animal clinic while using the Mobile 175. 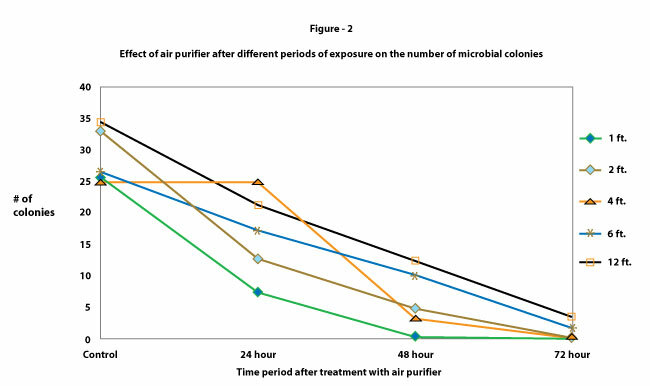 Reduction of VOCs in animal clinic while using the Mobile 175. Case Study 1: A cheese factory in Italy recently saw reductions of bacteria (91.67%), molds & yeast (67.18%) in the air, and bacteria (70.27%), molds (92.13%) and yeast (94.57%) on cheese surfaces. Case Study 2: A multi-billion dollar Meat Processor recently conducted a test which found 30% reductions of Aerobic Colony Count (ACC) on hard to reach raw meat surfaces (femur, aitch bone, etc. ), and 69- 90% on easier to reach raw meat surfaces. Case Study 3: A Grocery chain with over 150 locations found that Air Oasis proved to be far more effective than only using bleach, with 99.99% reductions of bacteria on all 5 tested surfaces. 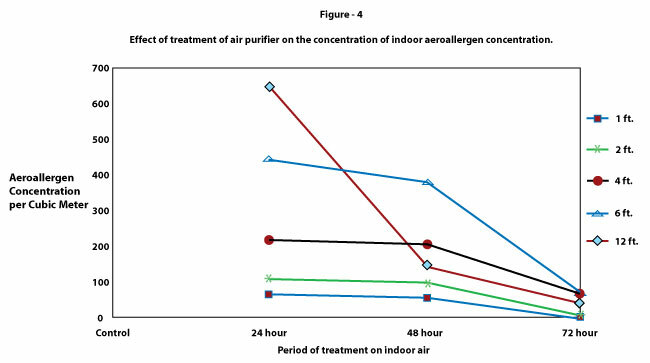 Case Study 4: CMA’s Multi-Containment Indoor Air Quality (IAQ) Report: Over the course of 3 hours, the Nano Induct maintained a 0.000 ppmv of O3 while dramatically reducing Total Bacteria Count (TBC) by 82.7%, Total Volatile Organic Compounds (TVOC) by greater than 99%, formaldehyde (HCHO) by 98.5%, Respiratory Suspended Particulate (RSP) by 35.5%, Ammonia (NH3) by 73.3%, and Hydrogen Sulfide (H2S) by greater than 97%. Case Study 5: Acoustics and Air Testing Laboratory’s HCHO and TVOC Miramar Shopping Center (Hong Kong) test: Air Oasis reduced HCHO by 44% and TVOC by 54% qualifying for “excellent” IAQ classification. Case Study 6: Coulter Animal Hospital Mold Reduction Study: West Texas A&M University conducted a study which showed 65.71% reduction in mold growth on the petri-dishes and 68.1% reduction in bacterial concentration (majority conidia and hyphae from Alternaria, spores from Dreschlera, Cladosporium and Stachybotrys chartarum). Case Study 7: LAWN Environmental Protection Ltd’s analysis of IAQ of Buses: Air samples after using Air Oasis now qualified for Excellent Air Quality for HCHO (46-77.5% reductions) and TVOC (66-82% reductions). Bacteria control was Excellent prior to the trial but still saw 22% reductions. 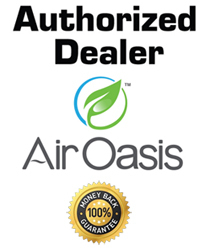 Pursuant to numerous years of detailed and thorough scientific studies and tests, I have concluded, documented and declare AIR OASIS brand air purification units to be one of the most effective technologies available today in combating airborne allergens, dust, animal dander, smoke, mold, mildew, bacterial and fungal colonies, and VOCs known to cause bad odors and serious health hazards. The specific quality of these air purifiers is that they do not use a filter and they can purify the air by removing all types of aeroallergens and bacterial strains including the harmful MRSA. My lab has been presenting the research all over the world on evaluating AIR OASIS air purifier which is unique by its name and action. 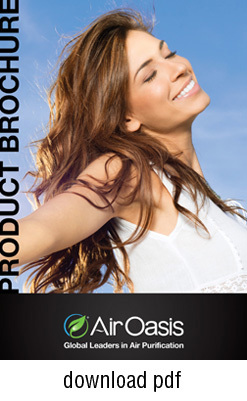 One recent and highly important study confirms AIR OASIS’s proprietary AHPCO technology, with the 6 nano- metal catalyst, directly reduces MRSA, both in the air and on surfaces. As such, I know of no other technology available that produces the high level of pathogen abatement as AIR OASIS air purification units. Dr. Ghosh obtained two Ph.D. 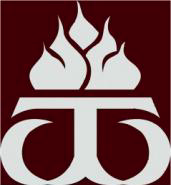 Degrees, one from The University of North Texas and the other from the University of Calcutta, India. He joined the WTAMU faculty in 2000 and has been teaching and doing research for 17 years. He has post-doctoral experience at Baylor College of Medicine in Houston, and he has taught at the University of North Texas, Richland College in Dallas and South Texas Community College in McAllen. 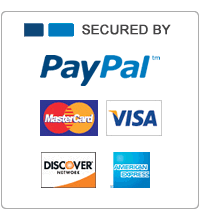 Please e-mail feedback@airoasis.com requesting a complete list of Dr.Ghosh’s abstracts to be sent via return e-mail.